If you love English football and you want to read detailed analysis of past English football games you will want a subscription to Backpass Magazine. Buy a single copy or subscription to Backpass magazine. 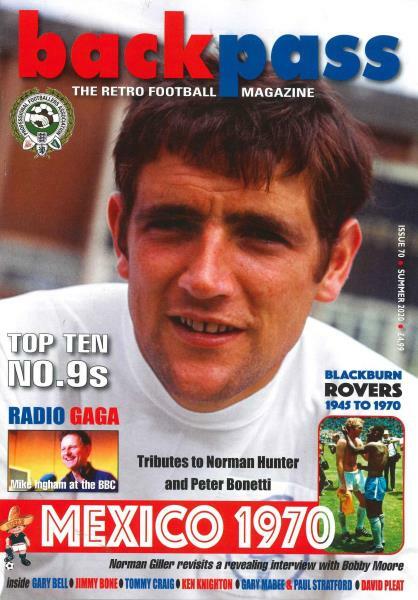 Backpass Magazine is the UK publication about retro football in the UK. The 64 page magazine features like Clive Toye, David Webb, Colin Suggett, Roy McDonough, Alex Dawson, Fred Dinenage, Mark Lillis, Mike Walker, Danny Malloy, David Hamilton’s Dream Team and Borough United in Europe. In Backpass Magazine you can review the highlights of big matches of ten different clubs. Football in England has a long history. English style football was created in England and has become the national sport of the country. The sport was created and codified in 1863. The main reason the current form of English football was created was to merge both public school and college football games. It has been proven that a form of team football with referees has been played in England since 1581. The word football was coined back in 1409 and there are references to the game of kicking a football in the Nottinhamshire Notts County in the 15th century. If you love English football and you want to read detailed analysis of past English football games you will want a subscription to Backpass Magazine.